Megan Switzer is a Masters student at the University of Maine in Orono. 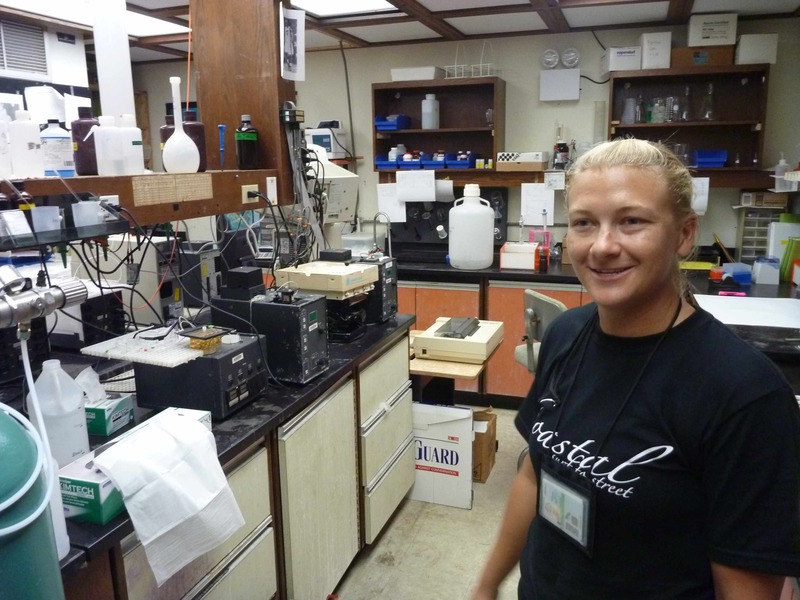 She works in Dave Townsend’s lab in the oceanography department. 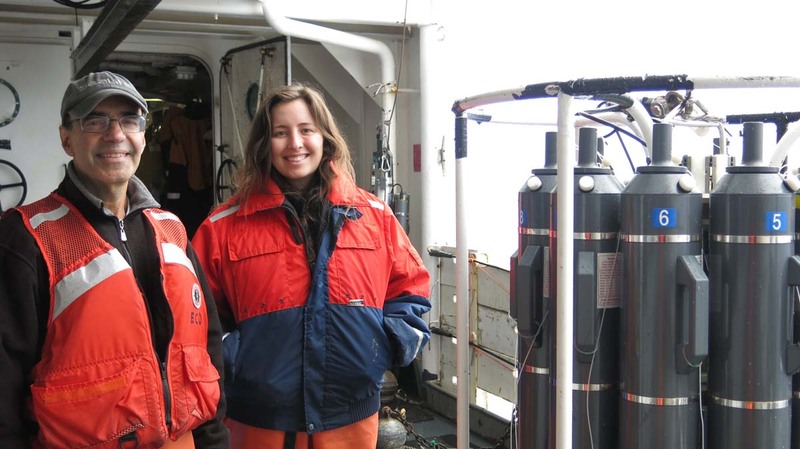 Her research focuses on interannual nutrient dynamics in the Gulf of Maine. 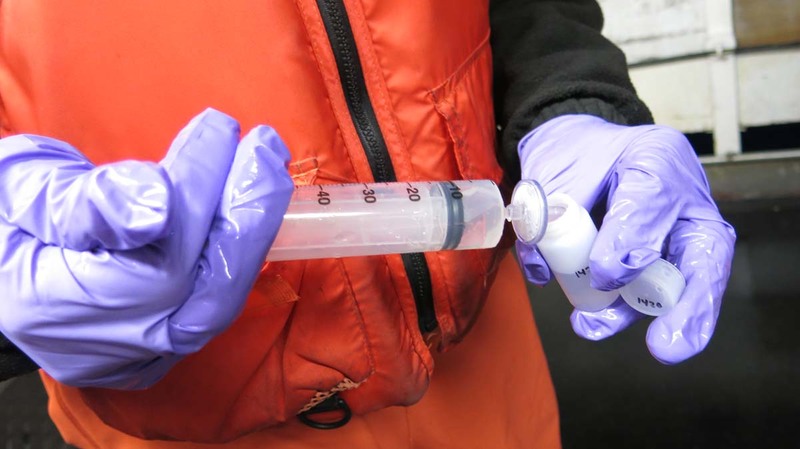 On this research cruise, she is collecting water samples from Gulf of Maine, as well as from Georges Bank, Southern New England (SNE), and the Mid Atlantic Bight (MAB). 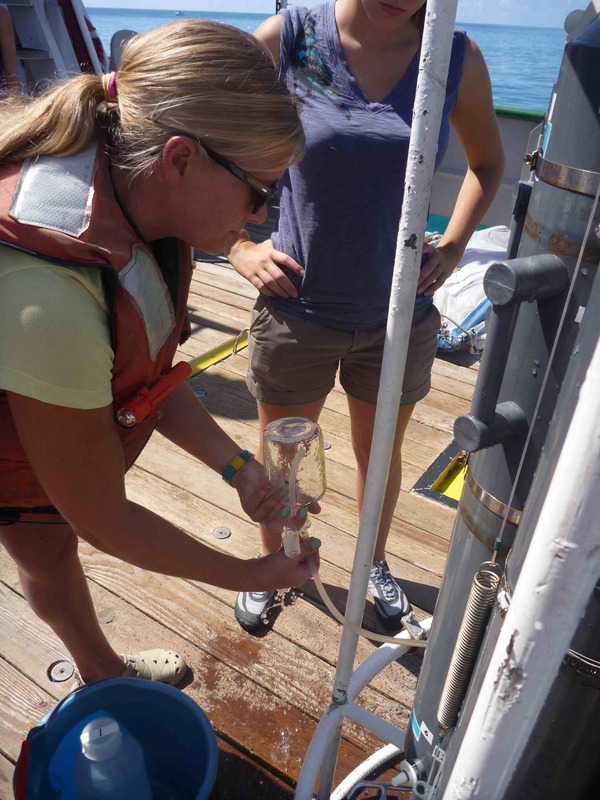 She is examining the relationship between dissolved nutrients (like nitrate and silicate) and phytoplankton blooms. 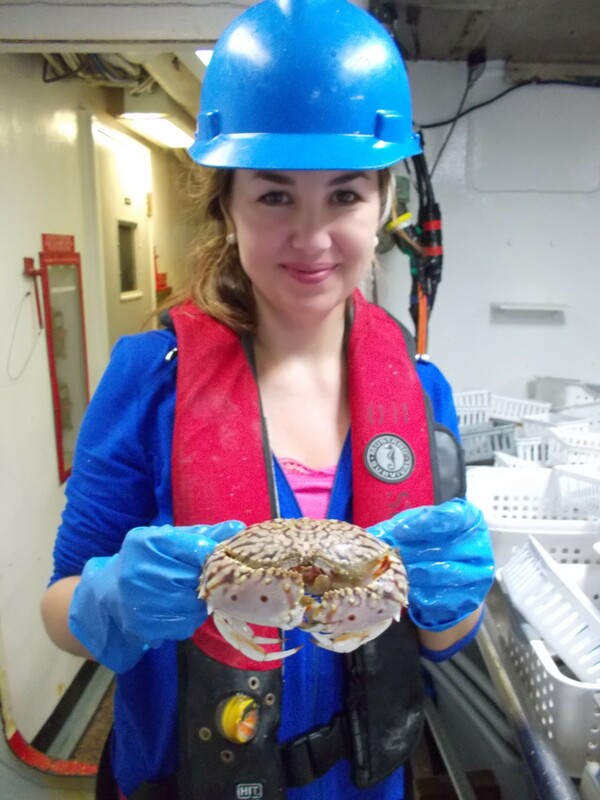 This is Megan’s first research cruise! In the generic ocean food chain, phytoplankton are the primary producers because they photosynthesize. They equate to plants on land. 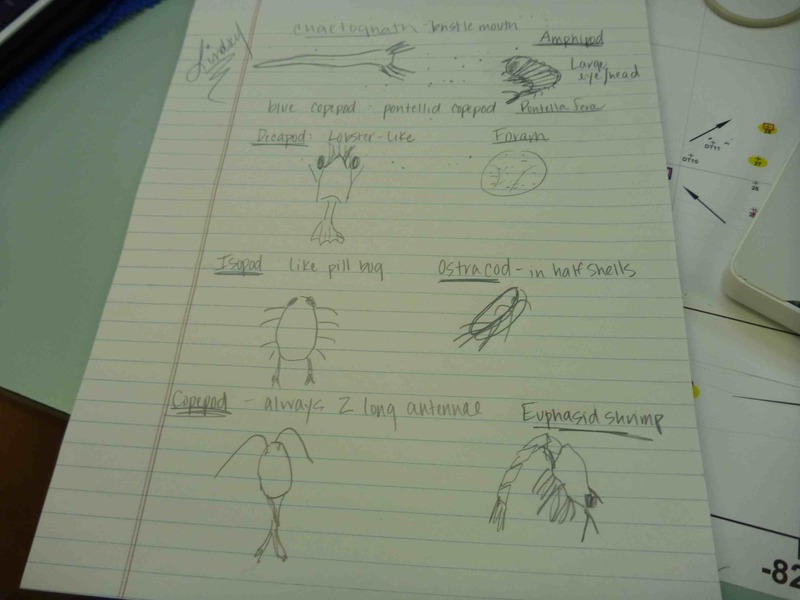 Zooplankton are the primary consumers because they eat the phytoplankton. There are so many of both kinds in the ocean. Megan is focusing on a particular phytoplankton called a diatom; it is the most common type of phytoplankton found in our oceans and is estimated to contribute up to 45% of the total oceanic primary production (Yool & Tyrrel 2003). 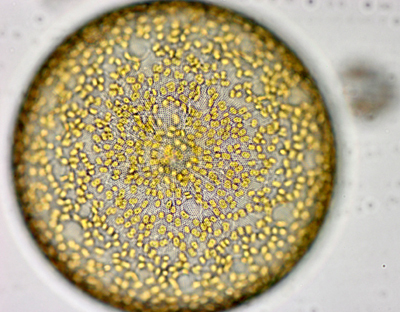 Diatoms are unicellular for the most part, and a unique feature of diatom cells is that they are enclosed within a cell wall made of silica called a frustule. The frustules are almost bilaterally symmetrical which is why they are called di (2)-atoms. Diatoms are microscopic and they are approximately 2 microns to about 500 microns (0.5 mm) in length, or about the width of a human hair. 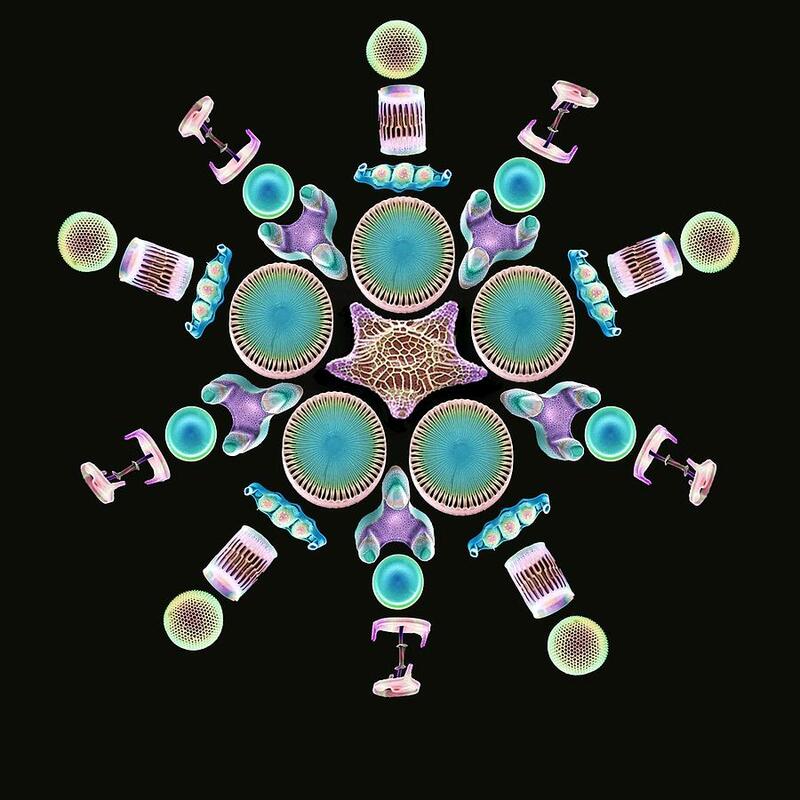 The most common species of diatoms are: Pseudonitzchia, Chaetocerous, Rhizosolenia, Thalassiosira, Coschinodiscus and Navicula. Diatoms also have ranges and tolerances for environmental variables, including nutrient concentration, suspended sediment, and flow regime. 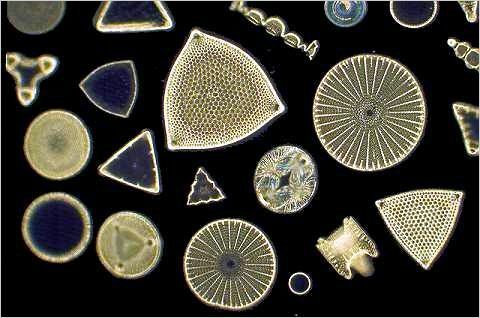 As a result, diatoms are used extensively in environmental assessment and monitoring. 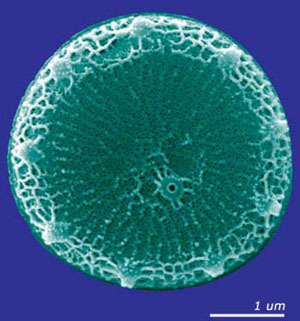 Furthermore, because the silica cell walls are inorganic substances that take a long time to dissolve, diatoms in marine and lake sediments can be used to interpret conditions in the past. In the Gulf of Maine, the seafloor sediment is constantly being re-suspended by tidal currents, bottom trawling, and storm events, and throughout most of the region there is a layer of re-suspended sediment at the bottom called the Bottom Nepheloid Layer. This layer is approximately 5-30 meters thick, and this can be identified with light attenuation and turbidity data. Megan uses a transmissometer, which is an instrument that tells her how clear the water is by measuring how much light can pass through it. Light attenuation, or the degree to which a beam of light is absorbed by stuff in the water, sharply increases within the bottom nepheloid layer since there are a lot more particles there to block the path of the light. 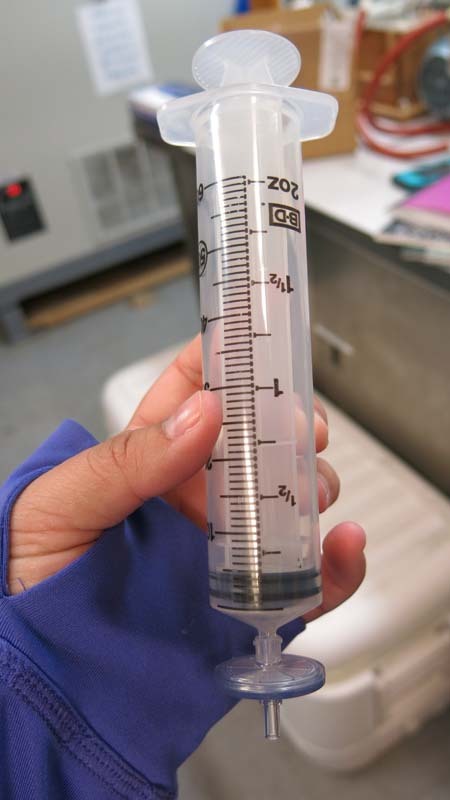 She also takes a water sample from the Benthic Nepheloid Layer to take back to the lab. 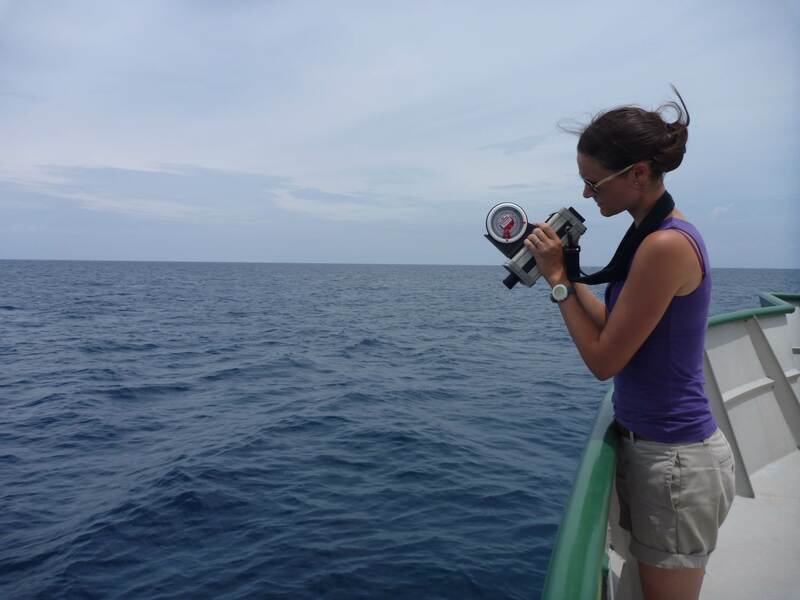 Megan also uses a fluorometer to measure the turbidity at various depths. Turbidity is a measure of how cloudy the water is. The water gets cloudy when sediment gets stirred up into it. 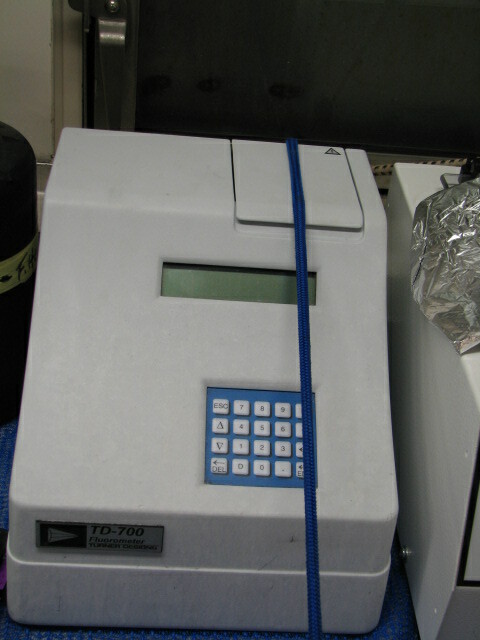 A fluorometer measures the degree to which light is reflected and scattered by suspended particles in the water. Taken together, the data from the fluorometer and the transmissometer will help Megan determine the amount of suspended particulate material at each station. 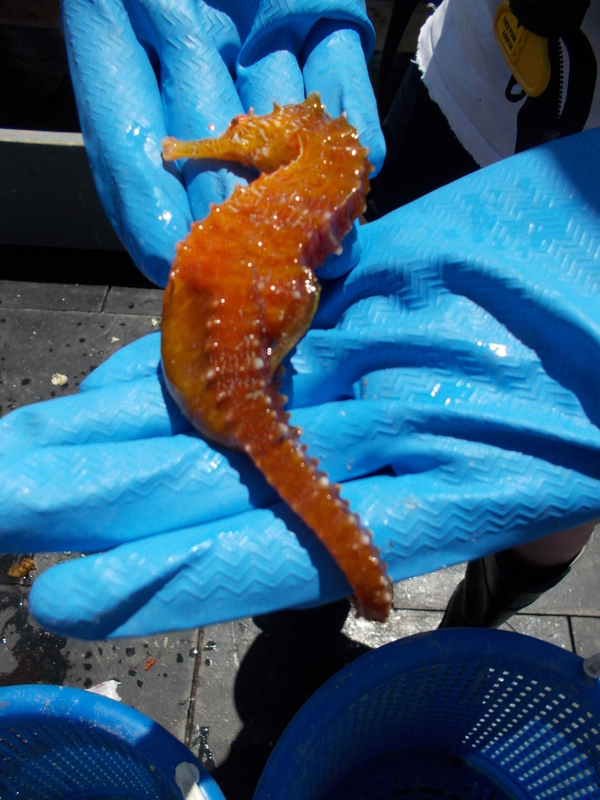 She also takes a water sample from the Benthic Nepheloid layer to take back to the lab. There, she can analyze the suspended particles and determine how many of them are made out of the silica based frustules of sinking diatoms. 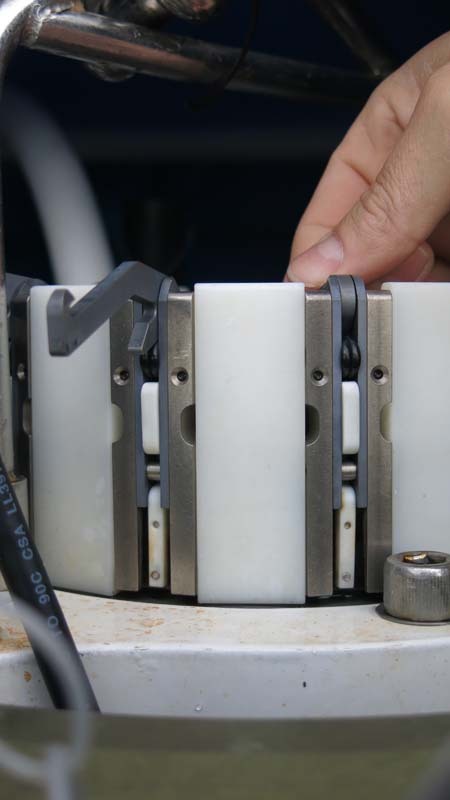 She collects water at depth on each of the CTD/ Rosette casts. CTD, Rosette, and Niskin Bottle basics. 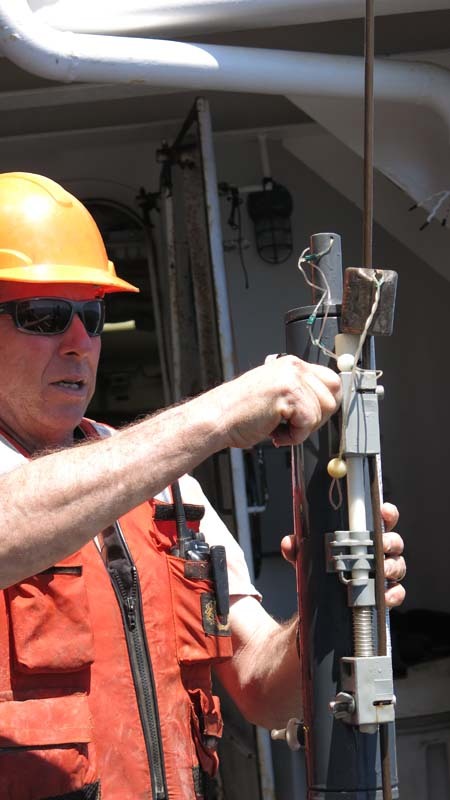 The CTD or (conductivity, temperature, and depth) is an instrument that contains a cluster of sensors, which measure conductivity, temperature, and pressure/ depth. 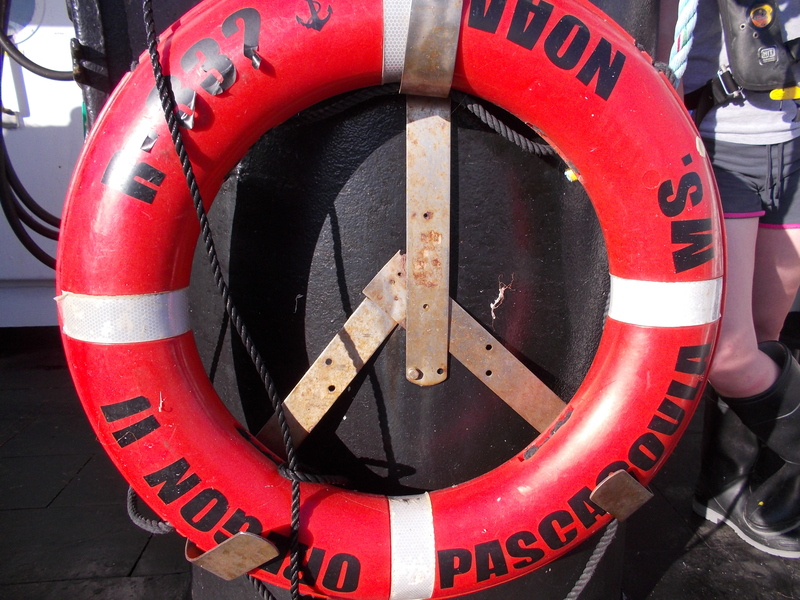 Here is a video of a CTD being retrieved. Depth measurements are derived from measurement of hydrostatic pressure, and salinity is measured from electrical conductivity. 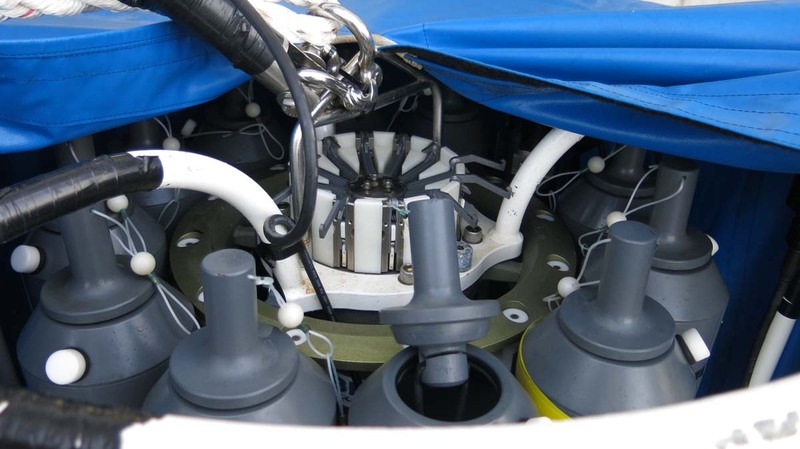 Sensors are arranged inside a metal housing, the metal used for the housing determining the depth to which the CTD can be lowered. 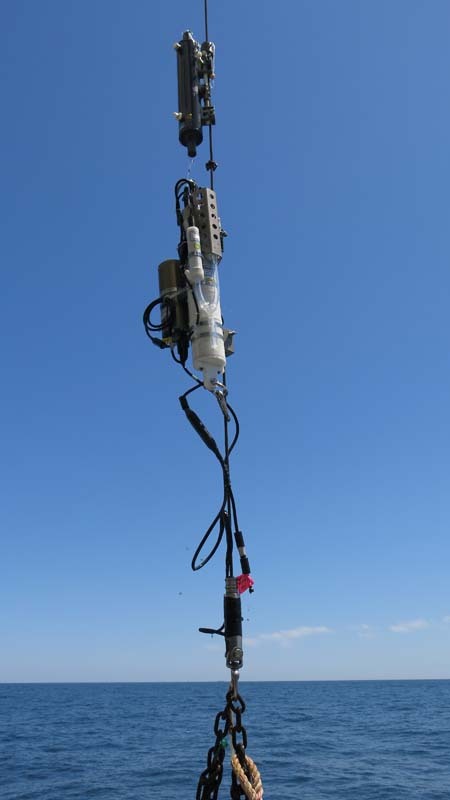 Other sensors may be added to the cluster, including some that measure chemical or biological parameters, such as dissolved oxygen and chlorophyll fluorescence. Chlorophyll fluorescence measures how many microscopic photosynthetic organisms (phytoplankton) are in the water. 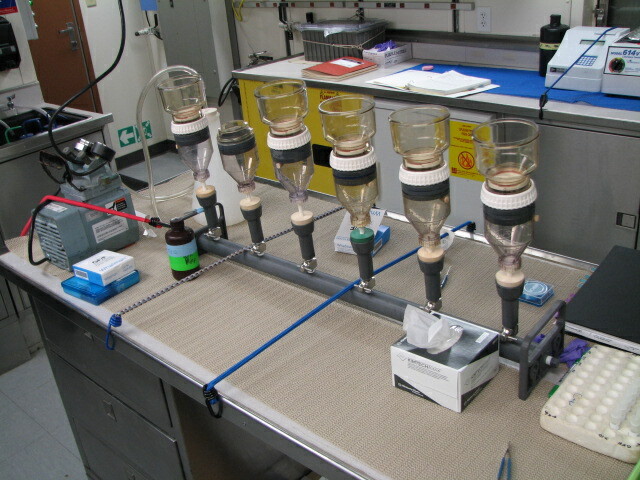 The most commonly used water sampler is known as a rosette. 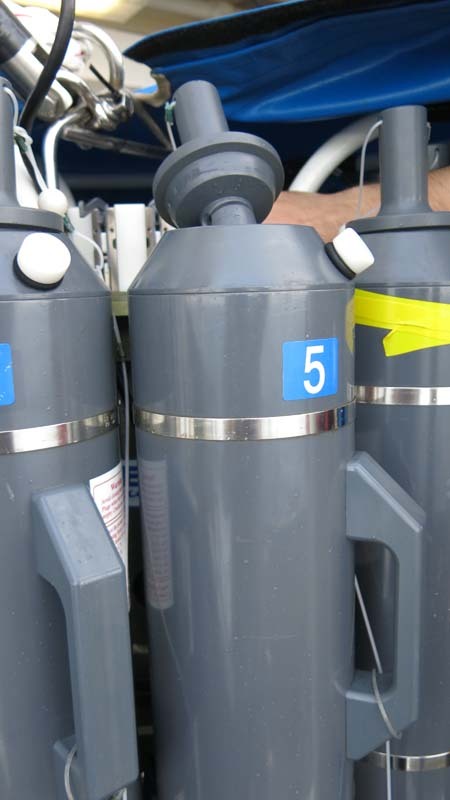 It is a framework with 12 to 36 sampling Niskin bottles (typically ranging from 1.7- to 30-liter capacity) clustered around a central cylinder, where a CTD or other sensor package can be attached. The Niskin bottle is actually a tube, which is usually plastic to minimize contamination of the sample, and open to the water at both ends. 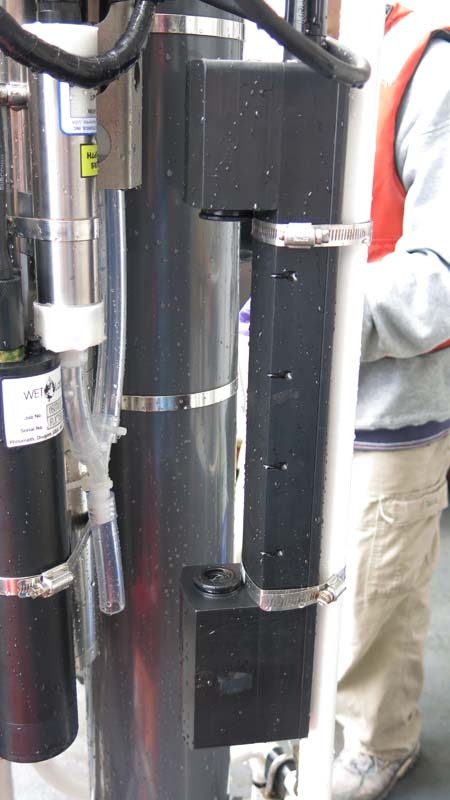 It has a vent knob that can be opened to drain the water sample from a spigot on the bottom of the tube to remove the water sample. The scientists all rinse their bottles three times and wear nitrile or nitrogen free gloves to prevent contamination to the samples. 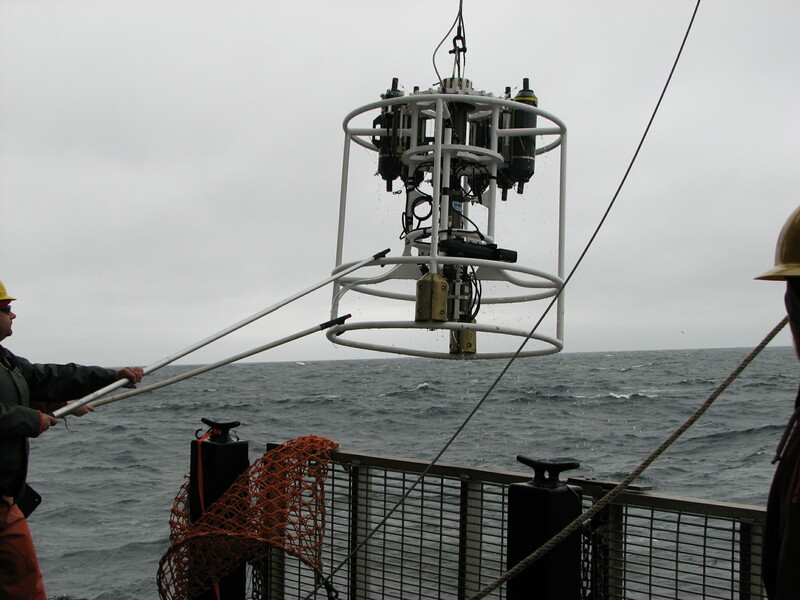 On NOAA ship Henry B. Bigelow the rosette is deployed from the starboard deck, from a section called the side sampling station of this research vessel. The instrument is lowered into the water with a winch operated by either Adrian (Chief Boatswain- in charge of deck department) or John (Lead Fishermen- second in command of deck department). 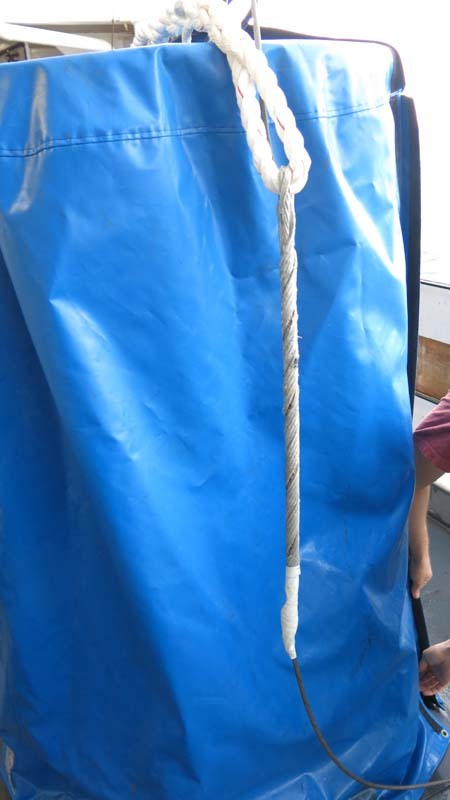 When the CTD/Rosette is lowered into the water it is called the downcast and it will travel to a determined depth or to a few meters above the ocean floor. There is a conducting wire cable is attached to the CTD frame connecting the CTD to an on board computer in the dry lab, and it allows instantaneous uploading and real time visualization of the collected data on the computer screen. 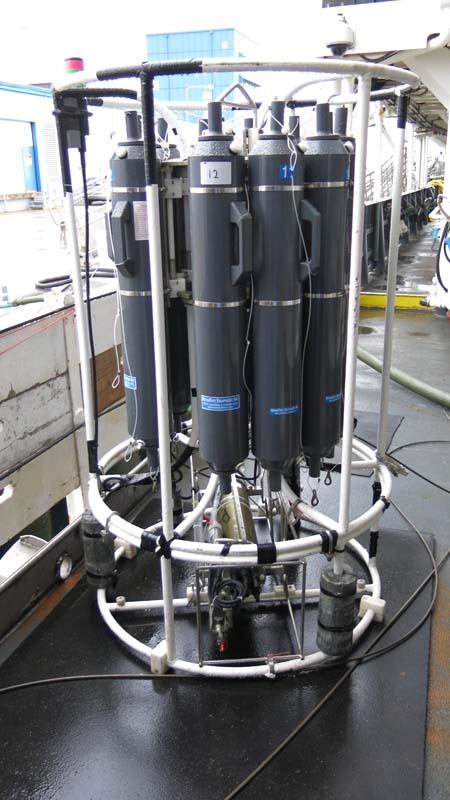 The water column profile of the downcast is used to determine the depths at which the rosette will be stopped on its way back to the surface (the upcast) to collect the water samples using the attached bottles. Messenger- The manual way to trigger the bottle is with a weight called a messenger. This is sent down a wire to a bottle at depth and hits a trigger button. The trigger is connected to two lanyards attached to caps on both ends of the bottle. When the messenger hits the trigger, elastic tubing inside the bottle closes it at the specified depth. The other way to trigger Niskin bottles is electronically. The same mechanism is in place but an electronic signal is sent down the wire through insulated and conductive sea cables (to prevent salt from interfering with conductivity) to trigger the mechanism. 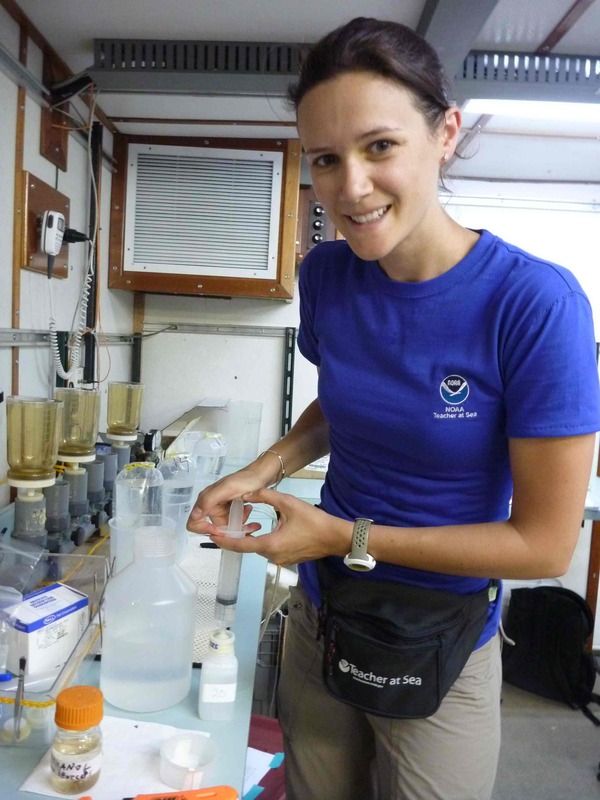 Using the Niskin bottles, Megan collects water samples at various depths. 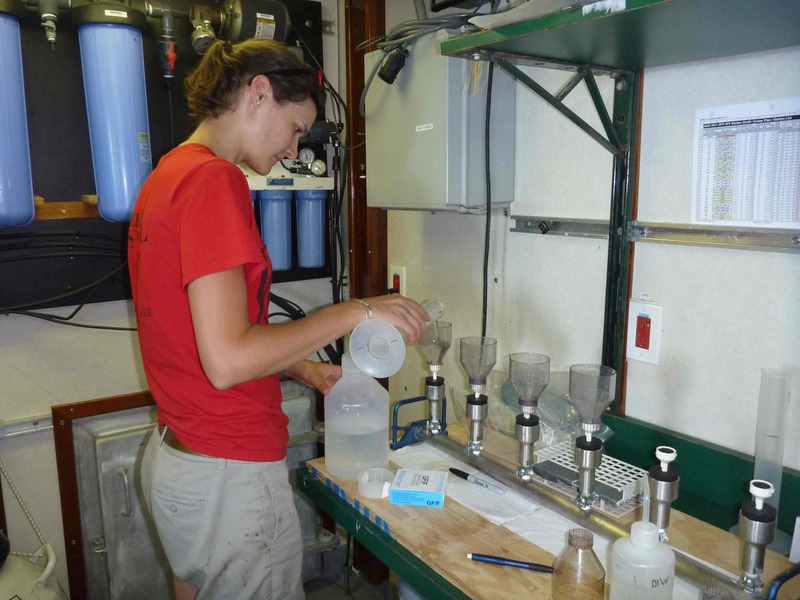 She then filters water samples for her small bottles with a syringe and a filter and the filter takes out the phytoplankton, zooplankton and any particulate matter. She does this so that there is nothing living in the water sample, because if there is there will be respiration and it will change the nutrient content of the water sample. This is part of the reason why we freeze the sample in the -80 C fridge right after they have been processed so that bacteria decomposing can’t change the nutrient content either. Diatoms dominate the spring phytoplankton bloom in the Gulf of Maine. They take up nitrate and silicate in roughly equal proportions, but both nutrients vary in concentrations from year to year. Silicate is almost always the limiting nutrient for diatom production in this region (Townsend et. al., 2010). Diatoms cannot grow without silicate, so when this nutrient is used up, diatom production comes to a halt. The deep offshore waters that supply the greatest source of dissolved nutrients to the Gulf of Maine are richer in nitrate than silicate, which means that silicate will be used up first by the diatoms with some nitrate left over. The amount of nitrate left over each year will affect the species composition of the other kinds of phytoplankton in the area (Townsend et. al., 2010). 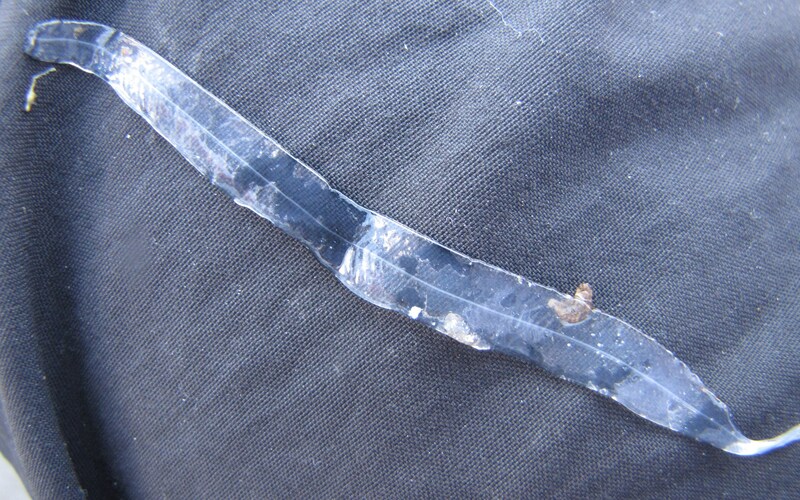 The silica in the frustules of the diatom are hard to breakdown and consequently these structures are likely to sink out of the euphotic zone and down to the seafloor before dissolving. If they get buried on the seafloor, then the silicate is taken out of the system. 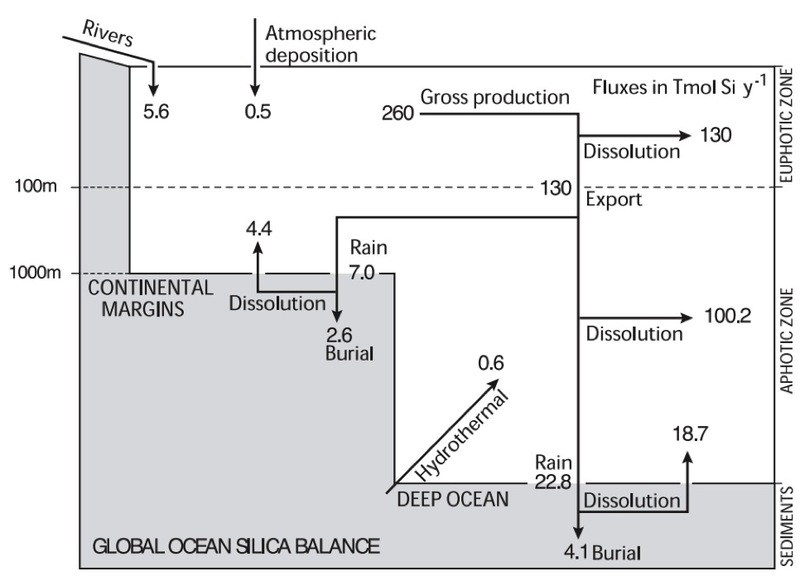 If they dissolve, then the dissolved silicate here might be a source of silicate to new production if it fluxes back to the top of the water column where the phytoplankton grow. Below are five images called depth slices. These indicate the silicate concentration (rainbow gradient) over a geographical area (Gulf of Maine) with depth (in meters) latitude and longitude on the x and y axis. This is the type of data Megan is hoping to process from this cruise. Do you ever wonder sometimes how people are so generous with their time and talents? That’s how I feel onboard the Oregon II with a crew that is simply amazing at their work. The thing is, though, they make it seem like it’s not work to them. Oh, it’s hard work-that’s certain. But they all seem to enjoy it. There is passion for the ocean here, for the environment, for honing your craft. I feel certain I’m among some of the best scientists, NOAA Corps Officers, Deck Crew, Engineers-you name it. As if that weren’t enough, you can’t beat the food in the Galley! 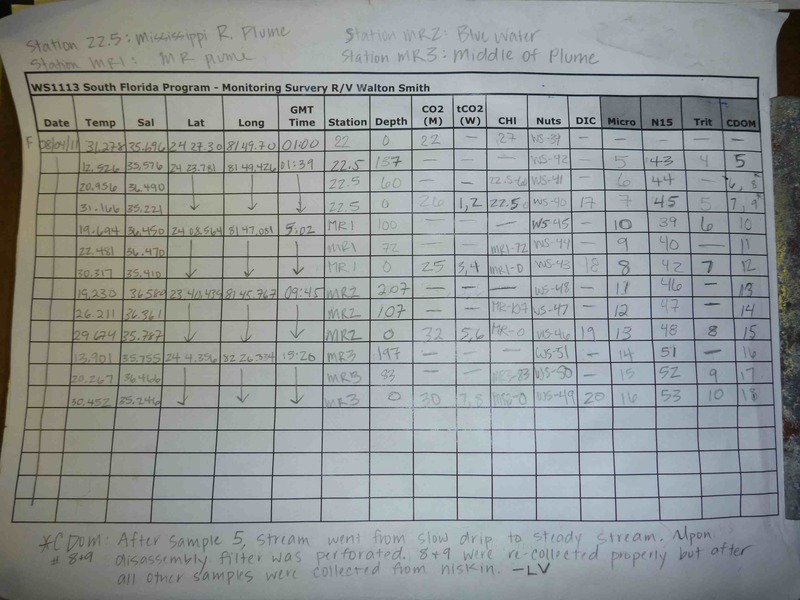 Who knew you could get French Silk Pie on a Groundfish Survey? Shhh….We’ll just keep that a secret! Many people like to write about the scientific facts of NOAA in their blogs and there’s certainly nothing wrong with that. I mean, this is science in action, right? Me, however? I like to write about how people make me feel. The people of the Oregon II make me feel welcome. They make me feel happy I’m here. I asked one of the scientists today to please tell me, without worrying about political correctness, if the crew really enjoys the teachers being on board. She readily answered, “I love for teachers to be here. You’re all so excited to learn and that makes it fun for us!” How refreshing. As I write this, someone just knocked on my door and told me they put my clothes in the dryer for me. Really? Does it get much better than this? Teacher at Sea is about learning what scientists do but to me, it’s also about immersing yourself in the work and the friendship on board. 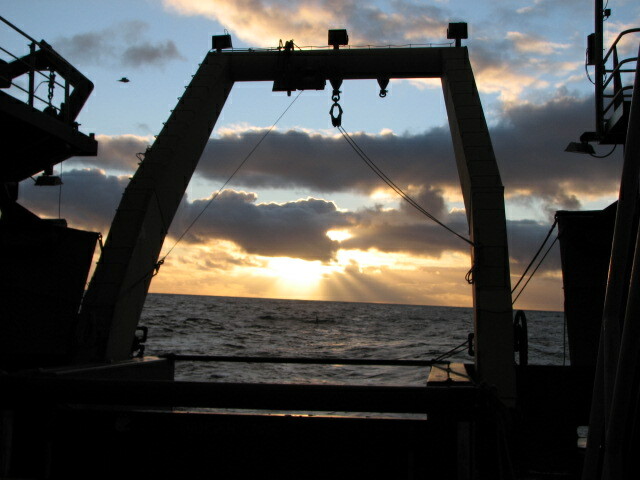 As I work the noon to midnight shift each day and the trawls come in, we “haul back” together. Brittany, Michael, and Mark know so much and I learn more and more each day. I’m thankful for them. Kim is sharing items I can use in my classroom. They’ve included me in what they do, they’re teaching me, and I’m making friends. For that, I am thankful. 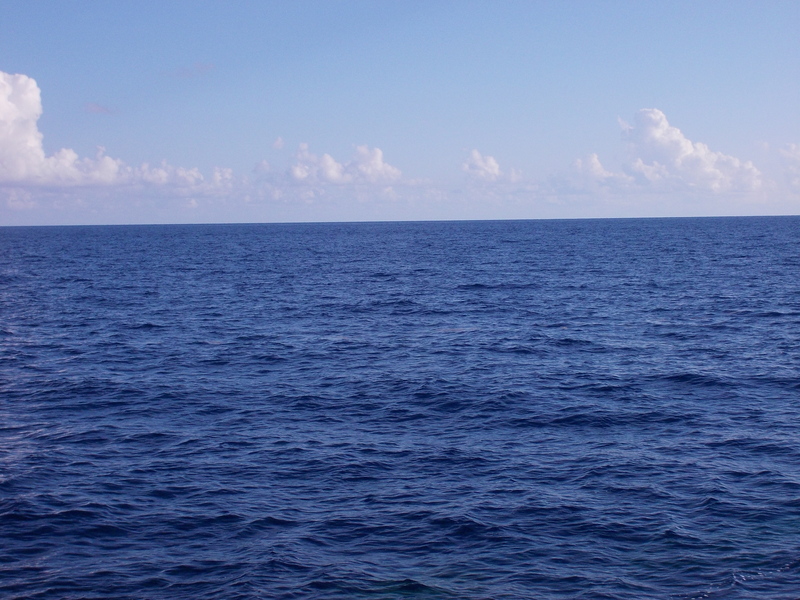 The beautiful blue ocean today~Blue skies and blue waters in the Gulf of Mexico. Brittany, Michael, and Mark share their wisdom with me as I learn about all the creatures of the sea. It’s truly magnificent to see so many different types of animals. It takes everyone working together to get the job done. There are beautiful creatures like this every day here. Well, they have beautiful qualities, too! This is the food chain in action! Our most persistent travel companions on the cruise are the flying fish and today they are the most abundant in the entire trip. Sit at the bow while we are plunging into the swells and it is impossible not to be mesmerized by what issues from the sea surface when old Triton blows his wreathed horn. Over the eons, fishes have experimented with many different avenues of escape from predators and competition, and soaring out of the water is arguably the most dramatic and effective. There are scores of species in the family Exocoetidae, which comes from Greek roots and refers to “sleeping outside” – which was logical to ancient mariners who believed the flying fishes left the ocean to sleep on the shoreline. I check the Ron Brown’s deck each morning, hoping one has inadvertently landed on it, but without luck so far. We flush them from both sides of the ship while underway. Like birds of a feather flocking together, some escaping groups are about a foot long with a wing span (Oversized pectoral fins to be exact) about the same spread. Juveniles in other schools look no larger than the silver dollar George Washington threw across the Delaware River(Or did he skip it for greater distance like these little fishes do off the crests of waves?). Between the sky, sea and sunsets, I thought I had seen all the shades of blue on this cruise, up to the moment we had a perfect view of a flying fish that soared past the railing and then steered off towards the horizon. 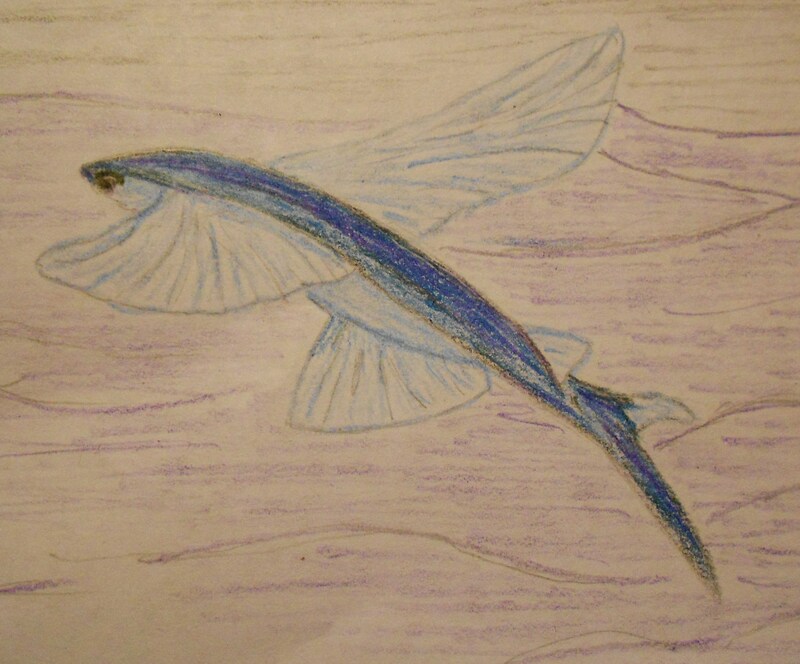 Flying fish exhibit all the colors of the near end of the spectrum as their attitude and altitude change in flight. Taking advantage of the mesoscale winds generated between swells, the fishes launch off wave crests and can soar farther than a football field; sustaining the flight time by sweeping their tail laterally in the water. Flying fish are harvested throughout the warmer waters of the ocean by man and beast, and are an important staple to island cultures. Barbados – to our south – is called the “land of the flying fish” and on the reverse side of a dollar coin that I kept after a Caribbean trip, one finds the fish in flight. When we are closer to land, I hope to see one of their main aerial opponents flying out to meet us – frigate birds. Impossible to photograph, for the time being, I’ll be content to admire their flights during the day, and at night, watch them dodge the attacks of mahi-mahi under the ship’s lights. Flying fish off the bow! Our British colleagues remembered to bring fishing poles and the mahi-mahi is the most sought after and elusive creature out here when the ship is “on-station” doing sampling. Fishes and squid routinely come to the surface and congregate under the stern lights, and occasionally a large mahi will lurk in the shadows and dart in close to us chasing prey. Also called dolphin-fish, our fishermen have learned only that the Hawaiian name Mahi-Mahi (Many Polynesian words are repeated) means “strong” since the hooked fishes have broken their fishing lines and escaped. Mahi is popular in restaurants and is a light, mild tasting fish. Swimming under the lights they look pale and eel-like, but when landed in a boat they exhibit a range of shades from blue and green that fades to golden – hence the Spanish name Dorado. Finally the fishermen had some luck and landed a jack – but without a fish guide, that’s as far as I can go in identifying it (Although the term “tuna” is loosely applied to most things that swim by.) Fortunately, I was able to get off an email and photo to Jeff Dement of the American Littoral Society (www.littoralsociety.org). When not fishing, Jeff runs the largest independent fish tagging program in the country; distributing tags to recreational fishermen and analyzing their thousands of returns to document where fishes migrate to and how fast they grow. 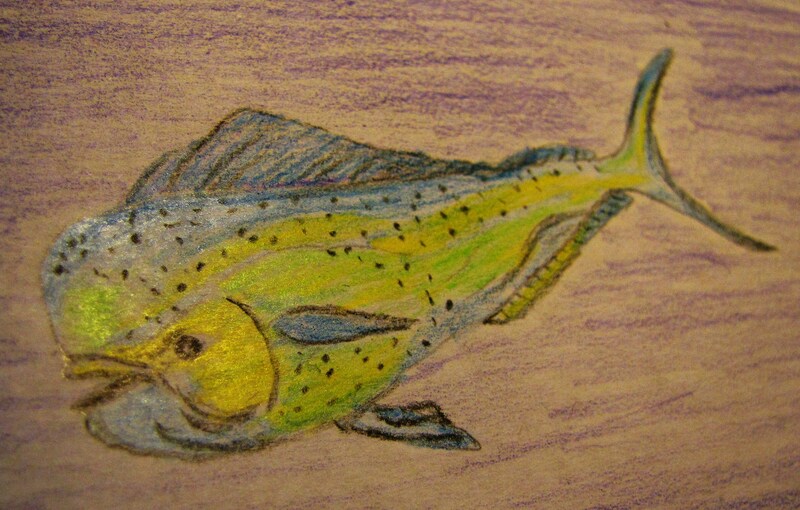 Like barracudas and some other apex predators of the reef, amberjacks are implicated in Ciguatera poisoning in humans. They acquire contaminants from eating herbivorous reef fishes that have ingested and accumulated Ciguatoxins produced by Dinoflagellates attached to marine algae they have been grazing upon. Harmless to the fishes, the poison is a neurotoxin in humans who are exposed to a concentrated dose from a top predator like the amberjack through the process called bioaccumulation. This is the same process that concentrates Mercury spewing into the atmosphere from coal-fired power plants, into the sea, then into plankton and forage fishes, and finally tuna. An amberjack gets a close look at people before returning to the sea. What is’t you do? what life lead? eh, dull goggles? How do ye vary your dull days and nights? It pays to be clear. 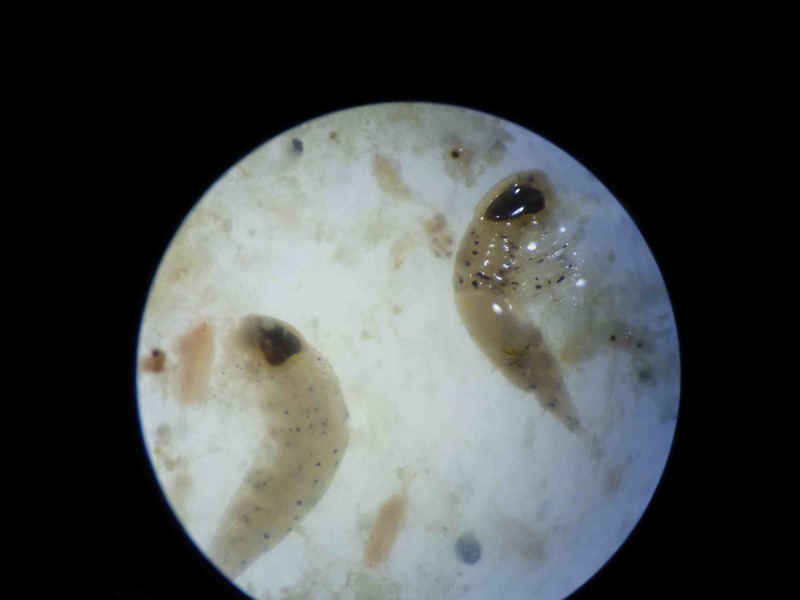 For me, the catch of the day is a leptocephali – a larval fish as long as my index finger, that I almost overlooked in the samples. A number of species go through this inconspicuous stage as zooplankton, and the most famous and intensely studied are the eels. American eels spend a year drifting to East Coast estuaries from their birthplace in the Sargasso Sea. The European species takes a more leisurely two-year tour of the North Atlantic on the Gulf Stream. 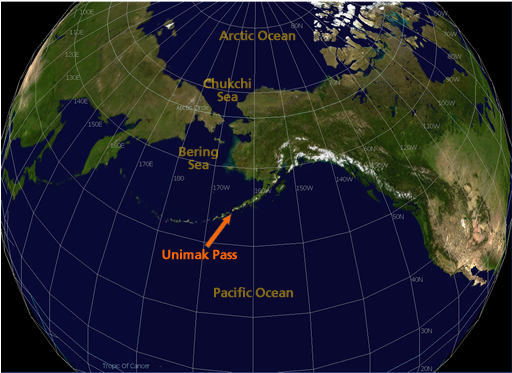 The last days of the survey cruise followed a pattern similar to the first days. Everyone got into the schedule of working 12-hour shifts and everyone accepted their role and responsibilities as a member of the team. 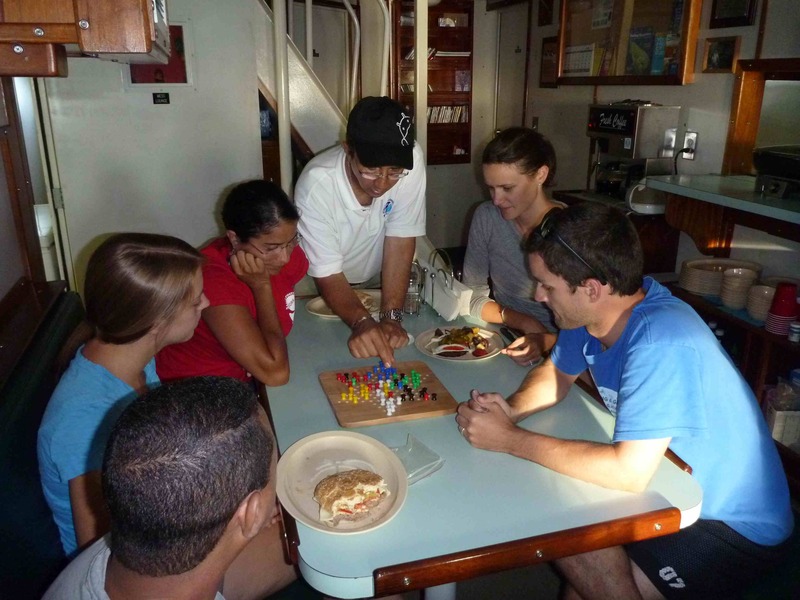 We all (morning and night shifts) ate dinner together and often (if there were no stations to be sampled) sat together to play board games, such as Chinese checkers. We also all watched the sunsets together — each one was spectacular! 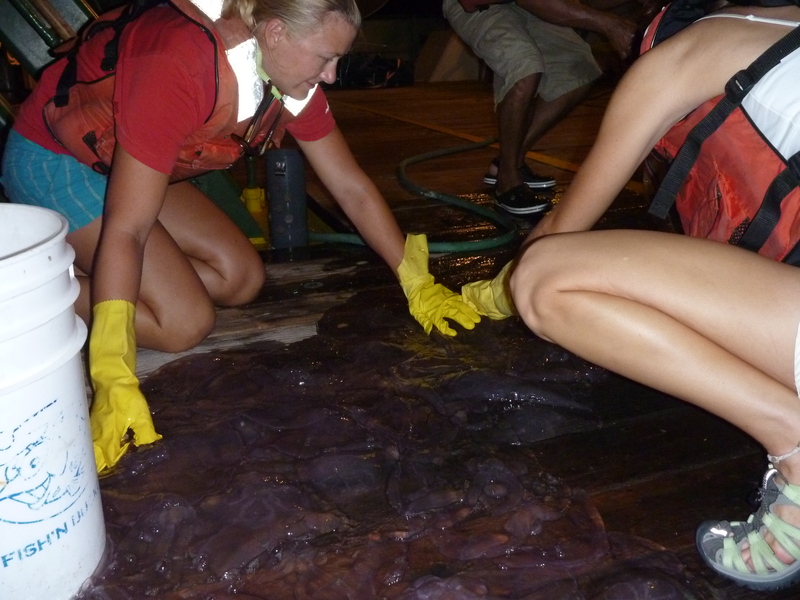 On the night of August 6th, we were towing the Neuston net through an area that had so many jellyfish that we could not lift the net out of the water. We had to get another net to help lift the heavy load. We all took bets to see how many jellyfish we had caught. I bet 15 jellyfish, but I was way off — there were over 50 jellyfish in the net! There were so many, that as we were counting them, they began to slide off the deck and back into the water. I have a great video that I cannot wait to share with you in September! Moon jellies sliding off the deck! The ship arrived back in Miami on Sunday night around 7:30pm. It was amazing how quickly everyone unloaded the scientific equipment and started to go their separate ways. 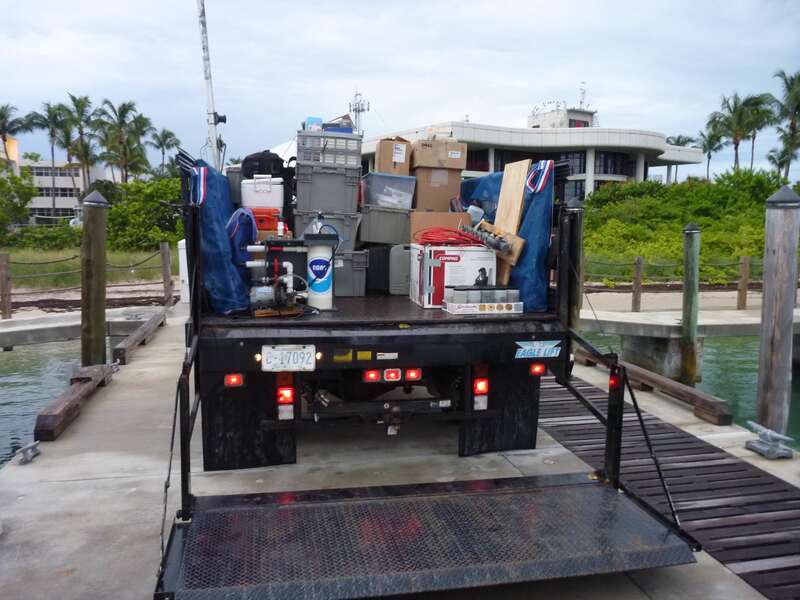 Because the NOAA building (Atlantic Oceanographic and Meterological Laboratory, AOML) is located right across the street from where the Walton Smith docks, we loaded all of the equipment into a truck and delivered it to the AOML building. This was great because I got a quick tour of the labs where Lindsey, Nelson and others run the samples through elaborate tests and computer programs in order to better understand the composition of the ocean water. In reflecting upon the entire experience, I feel extremely fortunate to have been granted the opportunity of a lifetime to participate in Teacher at Sea. 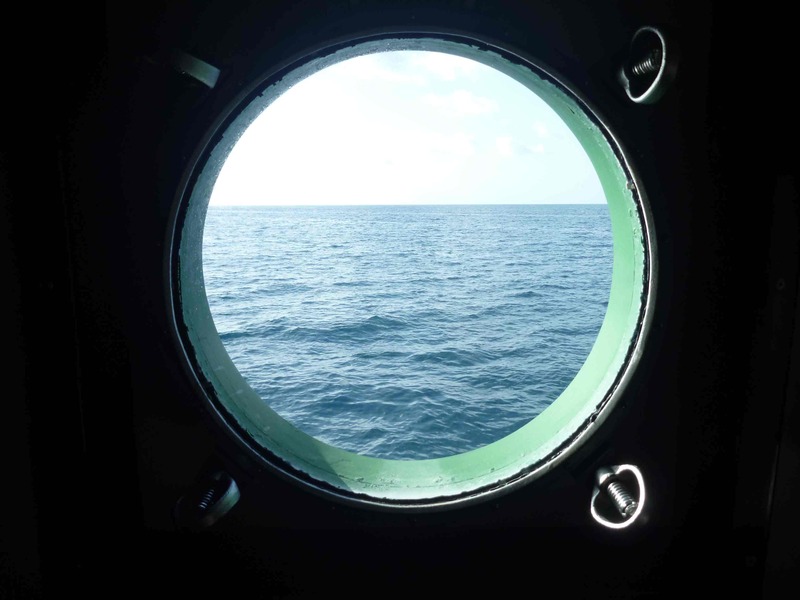 I was able to help with all aspects of the scientific research from optics, to chemistry, to marine biology as well as help with equipment that is usually reserved for the ship’s crew, such as lowering the CTD or tow nets into the water. There were many moments when I felt like some of my students who are struggling to learn either English or Spanish. 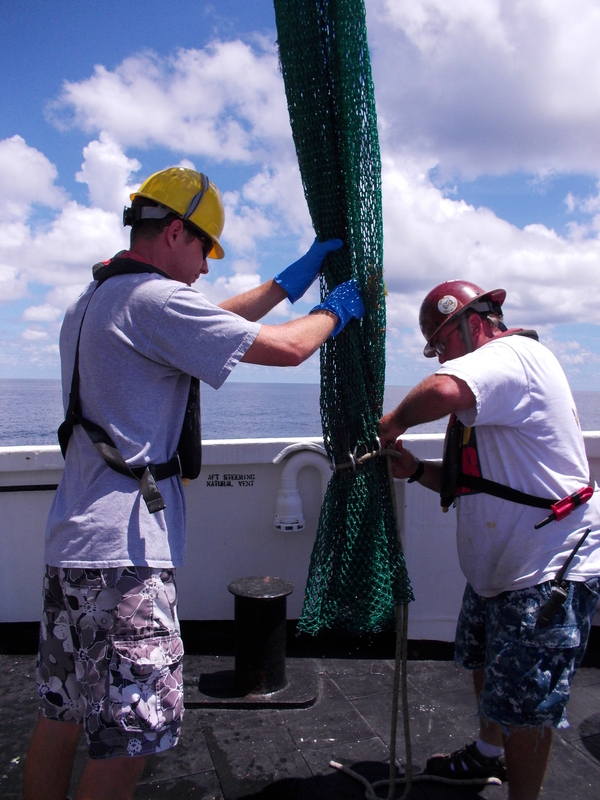 There are a lot of scientific terms, terms used to describe the equipment (CTD and tow net parts), and basic boat terminology that I had not been exposed to previously. I am thankful that all of the members of the cruise were patient with my constant questions (even when I would ask the same thing 3 or 4 times!) and who tried to explain complex concepts to me at a level that I would understand and be able to take back to my students. It makes me reflect again on everything I learned during my MEd classes in Multicultural/Multilingual Education — a good educator empowers students to ask questions, take risks, ask more questions, helps students access information at their level, is forever patient with students who are learning language at the same time that they are learning new concepts, provides plenty of hands-on experiments and experiences so students put into practice what they are learning about instead of just reading or writing about it. 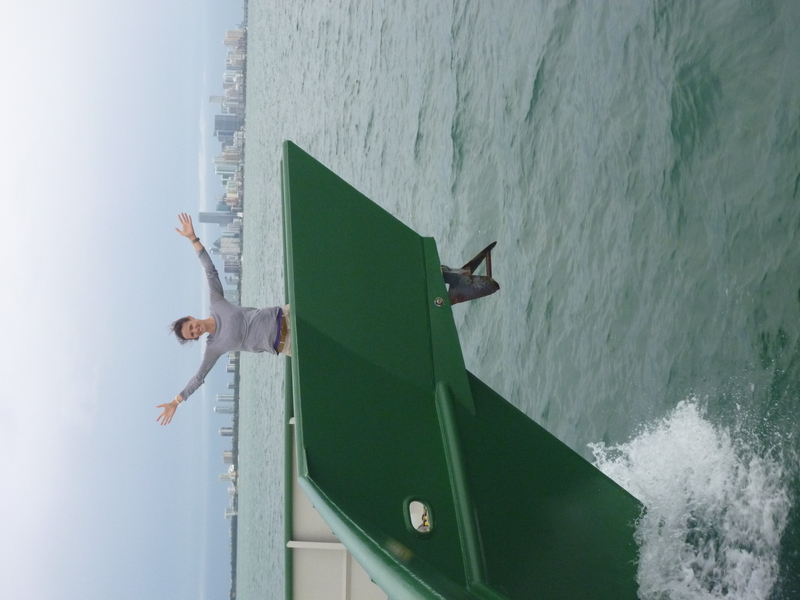 As we sailed into Miami, a bottlenose dolphin greeted us – sailing between the two hulls of the catamaran and coming up often for air. It was so close, that I could almost touch it! Even though I was sad that the survey cruise was over, it was as though the dolphin was welcoming me home and on to the next phase of my Teacher at Sea adventure: I return to the classroom in September loaded with great memories, anecdotes, first hand-experiences, and a more complete knowledge of oceanography and related marine science careers to help empower my students so that they consider becoming future scientists and engineers. Thank you Teacher at Sea! As I said yesterday, the oceanographic work on the boat basically falls into three categories: physical, chemical and biological. Today I will talk a bit more about the chemistry component of the work on the R/V Walton Smith. The information that the scientists are gathering from the ocean water is related to everything that we learn in science at Key – water, weather, ecosystems, habitats, the age of the water on Earth, erosion, pollution, etc. 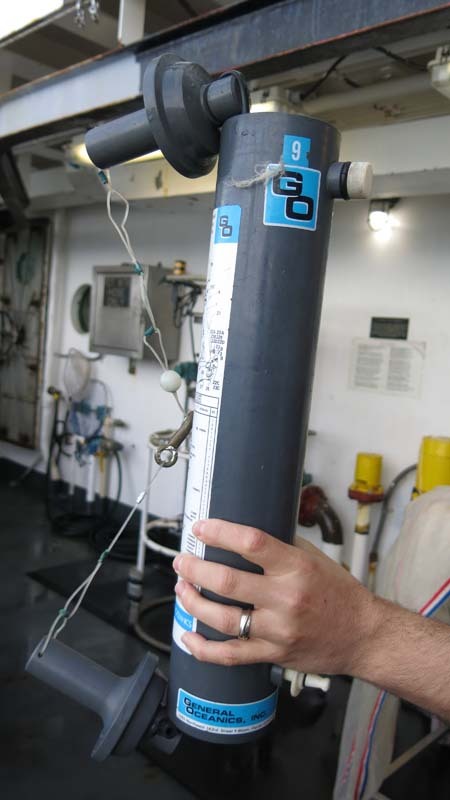 First of all, we are using a CTD (a special oceanographic instrument) to measure salinity, temperature, light, chlorophyll, and depth of the water. The instrument on this boat is very large (it weights about 1,000 lbs!) so we use a hydraulic system to raise it, place it in the water, and lower it down into the water. 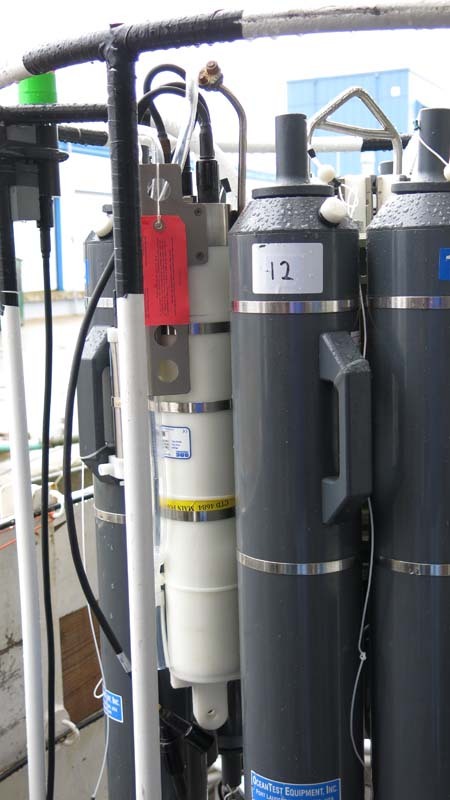 The CTD is surrounded by special niskin bottles that we can close at different depths in the water in order to get a pure sample of water from different specific depths. Nelson usually closes several bottles at the bottom of the ocean and at the surface and sometimes he closes others in the middle of the ocean if he is interested in getting specific information. For each layer, he closes at least 2 bottles in case one of them does not work properly. The Capitan lowers the CTD from a control booth on 01deck (the top deck of the boat), and two people wearing a hard hat and a life vest have to help guide the CTD into and out of the water. Safety first! 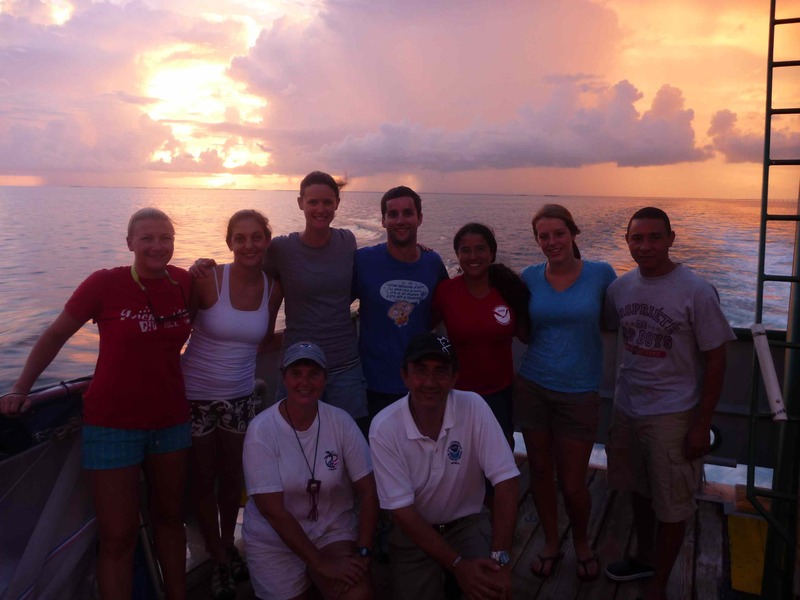 Once the CTD is back on the boat, the chemistry team (on the day shift, Lindsey and I are the chemistry team!) fills plastic bottles with water from each depth and takes them to the wet lab for processing. Throughout the entire process, it is very important to keep good records of the longitude and latitude, station #, depth of each sample, time, etc, and most importantly, which sample corresponds to which depth and station. We are taking samples for 6 different types of analyses on this cruise: nutrient analysis, chlorophyll analysis, carbon analysis, microbiology analysis, water mass tracers analysis and CDOM analysis. The nutrient analysis is to understand how much of each nutrient is in the water. This tells us about the availability of nutrients for phytoplankton. 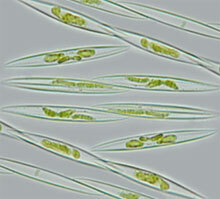 Phytoplankton need water, CO2, light and nutrients in order to live. The more nutrients there are in the water, the more phytoplankton can live in the water. This is important, because as I wrote yesterday – phytoplankton are the base of the food chain – they turn the sun’s energy into food. That said, too many nutrients can cause a sudden rise in phytoplankton. If this occurs, two things can happen: one is called a harmful algal bloom. Too much phytoplankton (algae) can release toxins into the water, harming fish and shellfish, and sometimes humans who are swimming when this occurs. Another consequence is that this large amount of plankton die and fall to the seafloor where bacteria decompose the dead phytoplankton. Bacteria need oxygen to survive so they use up all of the available oxygen in the water. Lack of oxygen causes the fish and other animals to either die or move to a different area. The zone then becomes a “dead zone” that cannot support life. There is a very large dead zone at the mouth of the Mississippi River. So we want to find a good balance of nutrients – not too many and not too few. The chlorophyll analysis serves a similar purpose. 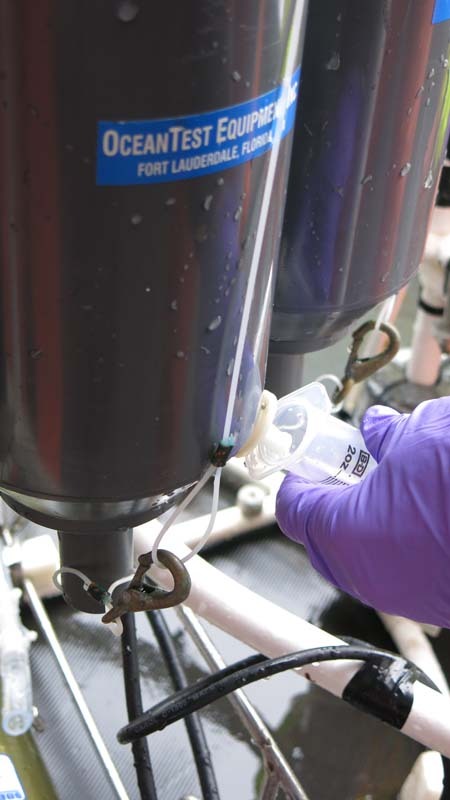 In the wet lab, we filter the phytoplankton onto a filter. Each phytoplankton has chloroplasts that contain chlorophyll. Do you remember from 4th grade science that plants use chlorophyll in order to undergo photosynthesis to make their own food? If scientists know the amount of chlorophyll in the ocean, they can estimate the amount of phytoplankton in the ocean. Carbon can be found in the form of carbon dioxide (CO2) or in the cells of organisms. Do you remember from 2nd and 4th grade science that plants use CO2 in order to grow? Phytoplankton also need CO2 in order to grow. 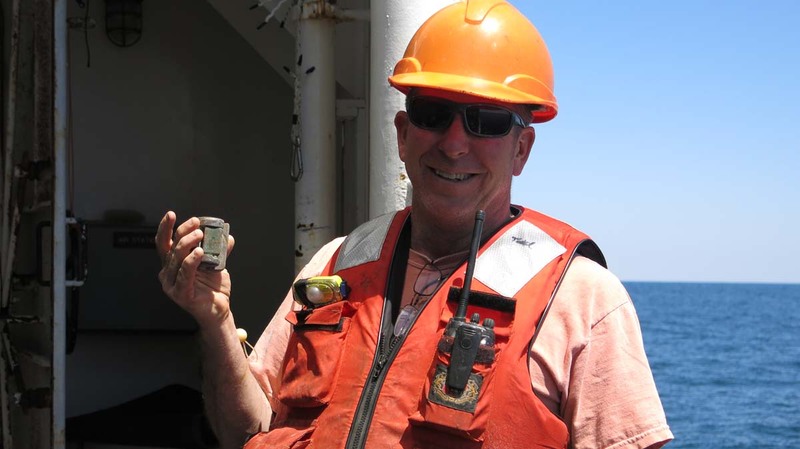 The carbon dioxide analysis is useful because it tells us the amount of CO2 in the ocean so we can understand if there is enough CO2 to support phytoplankton, algae and other plant life. The carbon analysis can tell us about the carbon cycle – the circulation of CO2 between the ocean and the air and this has an impact on climate change. The microbiology analysis looks for DNA (the building-blocks of all living organisms – kind of like a recipe or a blueprint). All living things are created with different patterns or codes of DNA. This analysis tells us whose DNA is present in the ocean water – which specific types of fish, bacteria, zooplankton, etc. The water mass tracers analysis (on this boat we are testing N15 – an isotope of Nitrogen, and also Tritium – a radioactive isotope of Hydrogen) helps scientists understand where the water here came from. 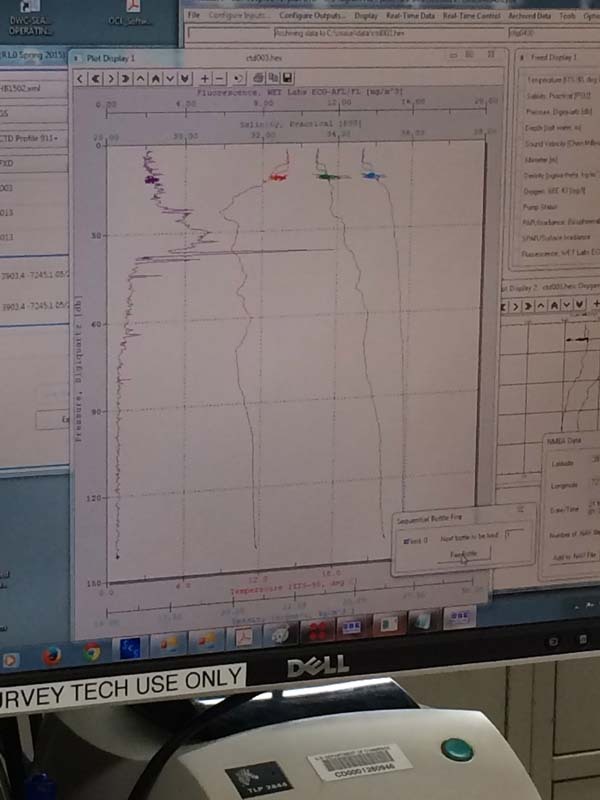 These analyses will help us verify if the Mississippi River water is running through the Florida Coast right now. From a global viewpoint, this type of test is important because it helps us understand about the circulation of ocean water around the world. 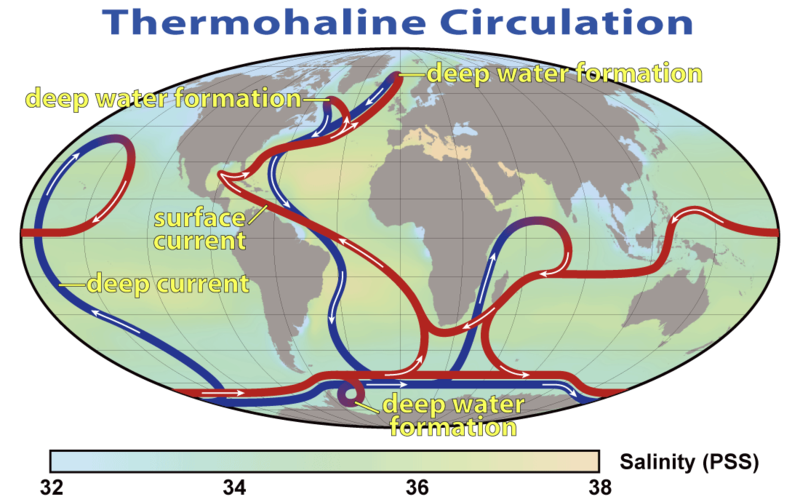 If the ocean water drastically changes its current “conveyor belt” circulation patterns, there could be real impact on the global climate. (Remember from 2nd and 3rd grade that the water cycle and oceans control the climate of Earth.) For example, Europe could become a lot colder and parts of the United States could become much hotter. The last type of analysis we prepared for was the CDOM (colored dissolved organic matter) analysis. This is important because like the water mass tracers, it tells us where this water came from. For example, did the water come from the Caribbean Sea, or did it come from freshwater rivers? 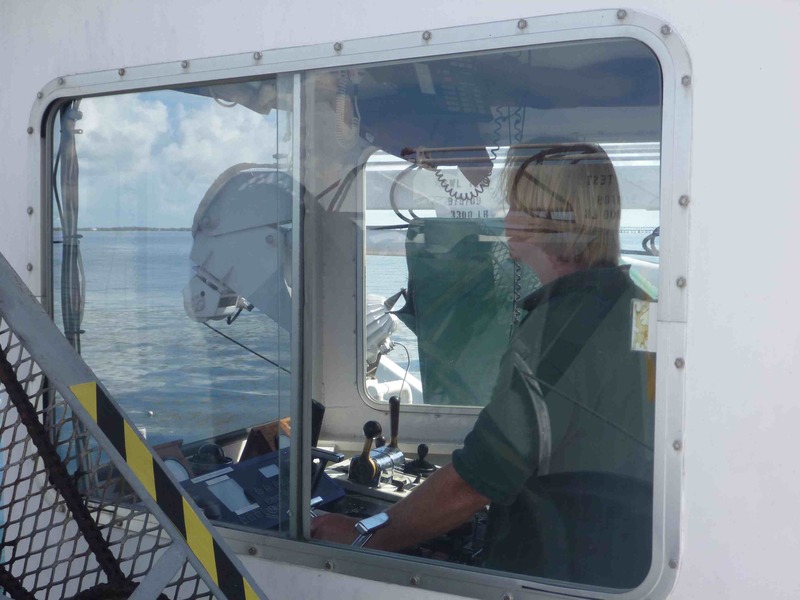 I am coming to understand that the main mission of this NOAA bimonthly survey cruise on the R/V Walton Smith is to monitor the waters of the Florida Coast and Florida Bay for changes in water chemistry. The Florida Bay has been receiving less fresh water runoff from the Everglades because many new housing developments have been built and fresh water is being sent along pipes to peoples’ houses. Because of this, the salinity of the Bay is getting higher and sea grass, fish, and other organisms are dying or leaving because they cannot live in such salty water. The Bay is very important for the marine ecosystem here because it provides a safe place for small fish and sea turtles to have babies and grow-up before heading out to the open ocean. This cruise has provided me great opportunities to see real science in action. It really reinforces everything I tell my students about being a scientist: teamwork, flexibility, patience, listening and critical thinking skills are all very important. It is also important to always keep your lab space clean and organized. It is important to keep accurate records of everything that you do on the correct data sheet. It can be easy to get excited about a fish or algae discovery and forget to keep a record of it, but that is not practicing good science. It is also important to stay safe – every time we are outside on the deck with the safety lines down, we must wear a life vest and if we are working with something that is overhead, we must wear a helmet. I have been interviewing the scientists and crew aboard the ship and I cannot wait to return to Arlington and begin to edit the video clips. I really want to help my students understand the variety of science/engineering and technology jobs and skills that are related to marine science, oceanography, and ships. I have also been capturing videos of the ship and scientists in action so students can take a virtual fieldtrip on the R/V Walton Smith. I have been taking so many photos and videos, that the scientists and crew almost run away from me when they see me pick up my cameras! The food continues to be wonderful, the sunsets spectacular, and my fellow shipmates entertaining. Tomorrow I hope to see dolphins swimming alongside the ship at sunrise! I will keep you posted!! The scientists and crew are working 12-hour shifts. I am lucky to have the “day shift” which is from 8am to 8pm. But some unlucky people are working the “night shift” from 8pm to 8am. They wake-up just as the sun is setting and go to sleep right when it rises again. One reason the shark longline survey exists is because the populations of many types of sharks are in decline. There are several reasons for this – finning is one reason. “Finning” is the process where the shark’s fin is removed from the rest of its body. 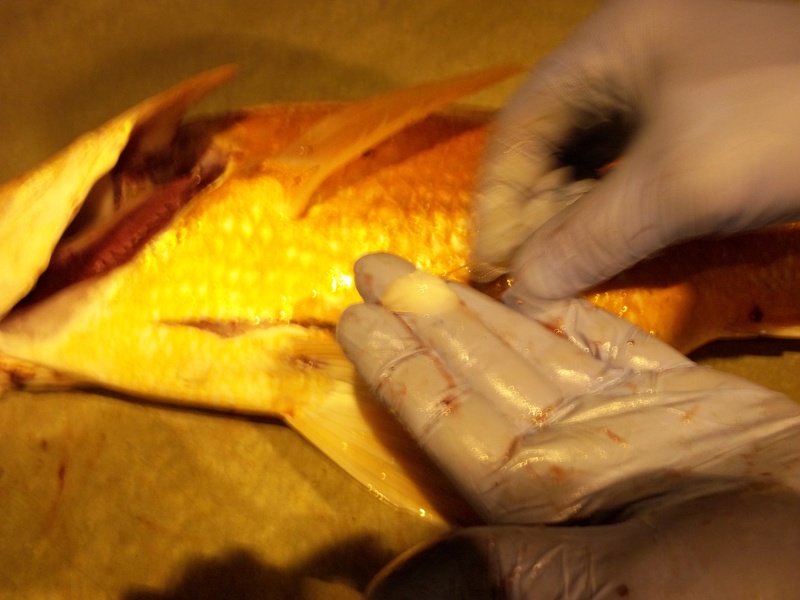 Since usually only the fin is desired, the rest of the body is discarded. Shark fins are used for things like shark fin soup – a delicacy in Asian cultures. 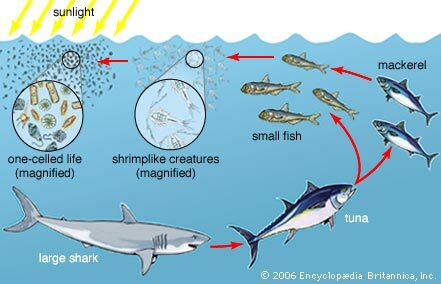 When the fin is cut off and the rest of the body stays in the water, the shark can not swim upright and eventually dies. While some regulations have been passed to prevent this, shark finning still occurs. Sharks are also overfished for their meat. 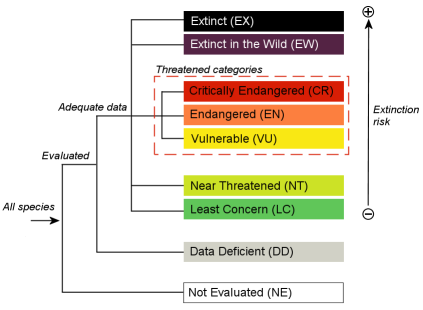 As a result many shark species have become vulnerable, threatened or endangered. Large sharks can take longer to reproduce. Therefore, they are more likely to be threatened or decline in their numbers. Sharks are at the top of the food chain. They keep prey populations in control, without which the marine ecosystem would be unstable. This is why the mission of the shark longline survey is important. 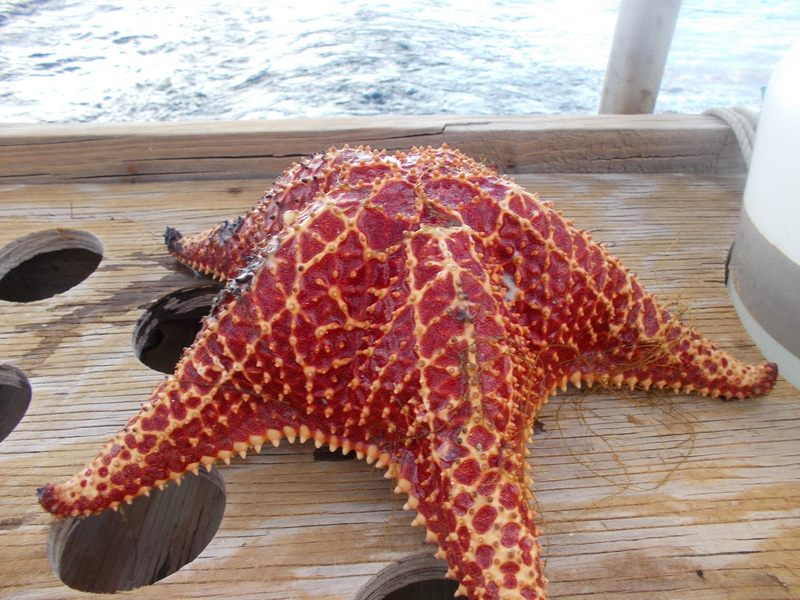 The identification tags and roto tags used during this survey along with the data collected will help scientists assess the abundance of species in this area. They can then provide recommendations for shark management. On average, we are collecting data on 10 sharks per line (or 10%), although our catch rates are between 0% and around 50%. With 50 stations in all, that would be data on approximately 500 sharks (on average). During my shift, we sometimes catch things we do not intend to catch. We might reel in fish or other sea creatures that get caught on the hooks. This is called “bycatch”. 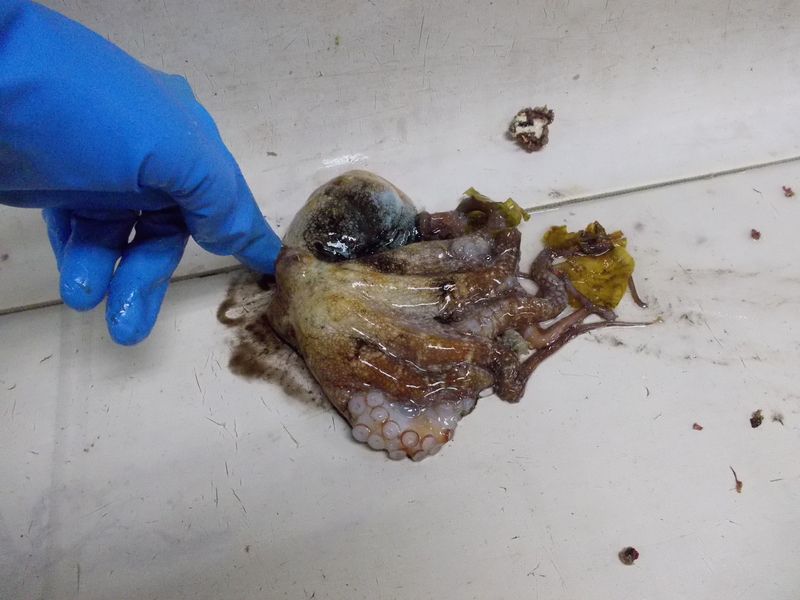 While everything is done to try to catch only the things we are interested in studying, bycatch occasionally happens. The fish are only on our line for 1 hour, so their survival rates are pretty good. Our bycatch data is a very important element and also contributes to management plans for a number of species like snappers and groupers. 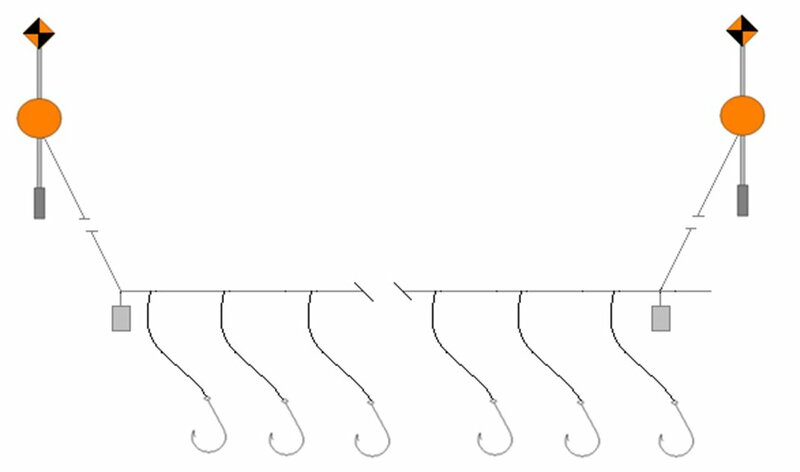 Our longline gear includes two high flyer buoys, and hooks that are weighted down so they reach the bottom. Just the other day, we caught a remora (a suckerfish that attaches itself to a shark’s side). Remoras and sharks have a commensalism relationship – the remora gets leftover food bits after the shark eats, but the shark gets no benefit from the remora. We quickly took down its measurements in order to get it back into the water quickly. 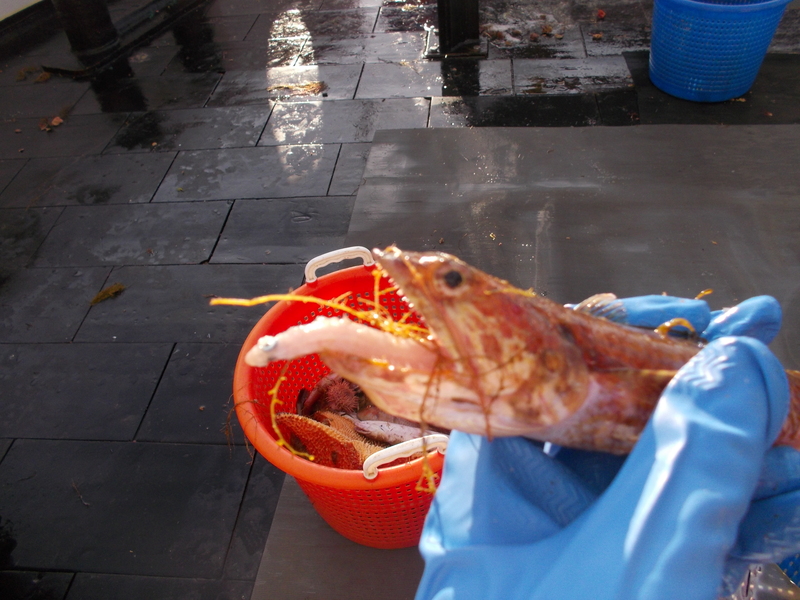 Other bycatch included an eel, and black sea bass. 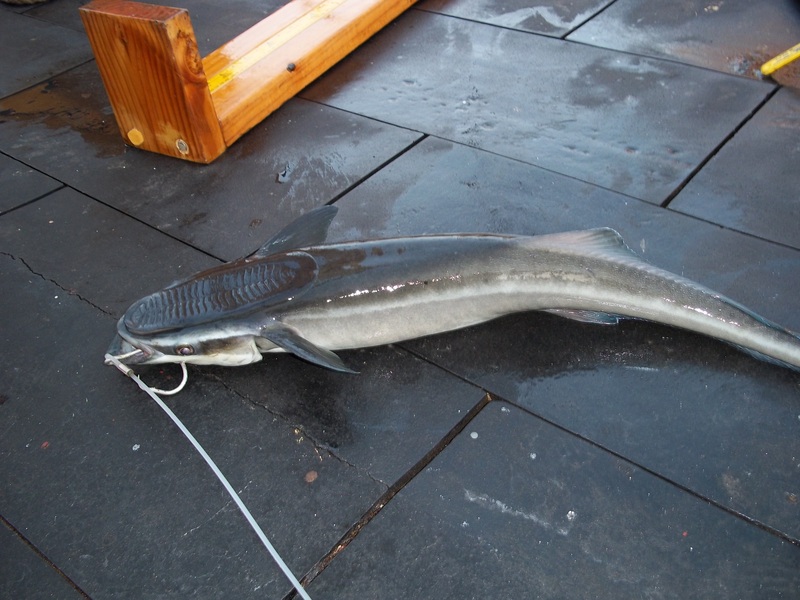 This sharksucker is an example of bycatch. This moray eel accidentally found its way onto a hook. 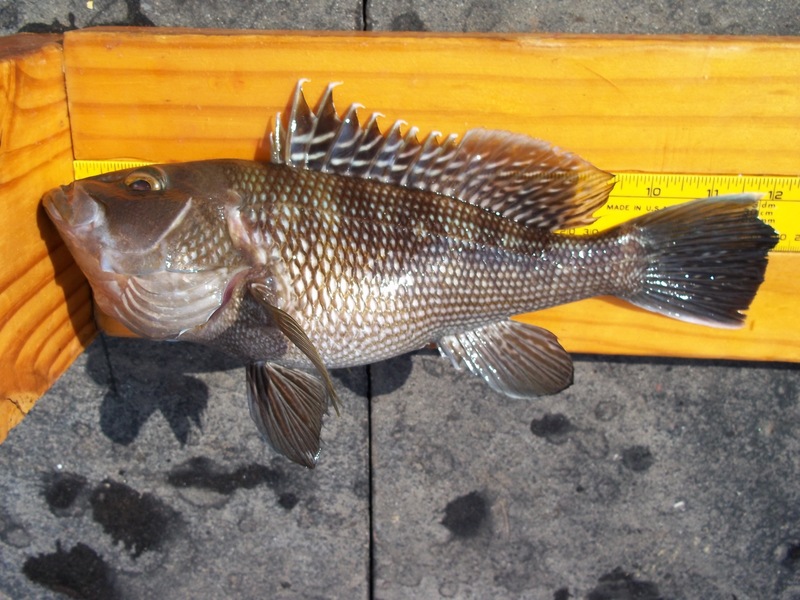 Bycatch - a black sea bass. This otolith (tiny white bone in center) helps this red snapper with its sense of balance. We also caught a red snapper. 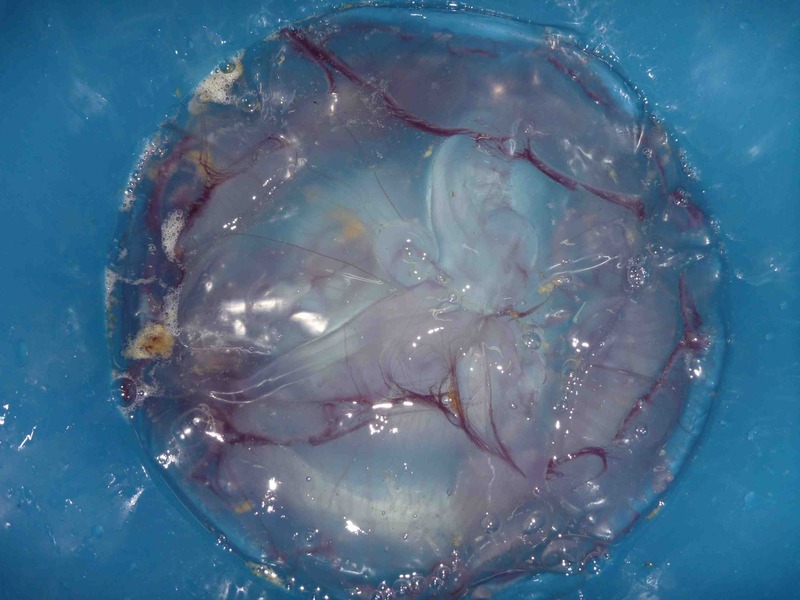 Our chief scientist, Mark, showed me the two small, tiny ear bones called “otoliths” in the snapper’s head. These bones provide the fish with a sense of balance – kind of like the way our inner ear provides us with information on where we are in space (am I upside down, right side up, left, right?). You can tell the age of a snapper by counting the annual growth rings on the otoliths just like counting growth rings on a tree. 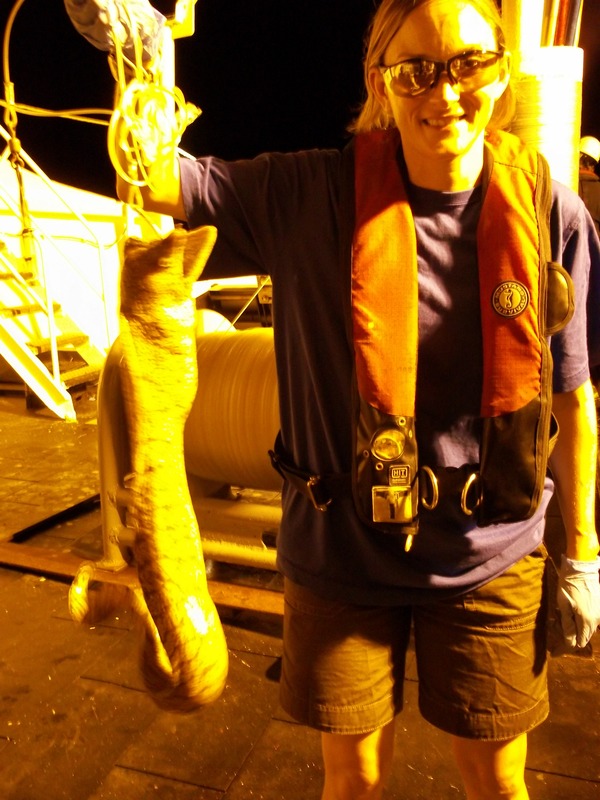 My experience aboard the Oregon II has given me a better understanding of the vulnerability of some shark species. While many of us may think that sharks can be threatening to humans, it is more accurate the other way around. Sharks are more threatened by humans than humans are threatened by sharks. This is due to our human behaviors (mentioned above). Today I saw dolphins following our boat off the bow. There were about 6 or 7 of them all swimming together in a synchronized pattern (popping up for air all at the same time). It was really quite a treat to watch. I’m also amazed by the amount of stars in the sky. With the lights off on the bow, you can really see a lot of stars. I was also able to see the milky way. There have been many storms off the horizon which are really cool to watch at night. The whole sky lights up with lightning in the distance, so I sat and watched for a while. With tropical storm Emily coming upon us, we may have to return to port earlier than planned, but nothing is set in stone just yet. I hope we don’t have to end the survey early.